HamStuff by W7NN has a complete line of Index Dividers for all your QSL storage needs. What you order depends on how many QSL cards you have and how you want to organize them for various awards or other needs. Sorting and finding QSL cards for the Worked All States award is much easier if the cards are organized by States. The States Dividers are $12.00 per set plus $3.00 s/h. The DXCC Dividers are based on the ARRL Country list and make for an impressive display in your ham shack, and easy retrieval of your cards. Due to the constantly changing DXCC entity list, we are now introducing the DXCC DividerKit. The DividerKit consists of 350 custom manufactured index dividers with our standard 3rd cut tabs, designed to fit our QSL CardBox. The paper stock is heavy 110# with mylar tabs. We include the pre-printed labels in sheet form for you to apply to each card. The labels are accurate to the ARRL DXCC Entity list on the day of shipping. We will ship the clear mylar labels unless our optional white labels are specified. The DXCC DividerKit $39.00 per set plus $12.00 s/h. New! With the success of the DXCC DividerKit, we are also able to offer the DXCC Deleted Entities Dividers and Labels. This kit consists of 61 of our dividers we use in the DXCC kit, + labels for each of the deleted entities currently on the ARRL list. The cost is just $10.00 per set + $2.00 s/h. Most hams use the DXCC Dividers for DX cards, with the States Dividers for the U.S. States, and the Alphabetical Dividers for cards from any one country where you may get hundreds or thousands of cards. The Alphabetical Dividers are $6.00 per set plus $2.00 s/h. # Dividers are available for $2.00 per set + $1.00 s/h. 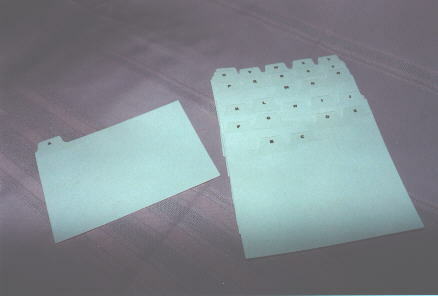 Many hams also order the Blank Dividers for special needs, deleted countries or future countries. The blanks are now manufactured from our new 110# card stock and the tabs are heat laminated with clear Mylar. . A set of 25 Blanks is $5.00 plus $2.00 s/h. . 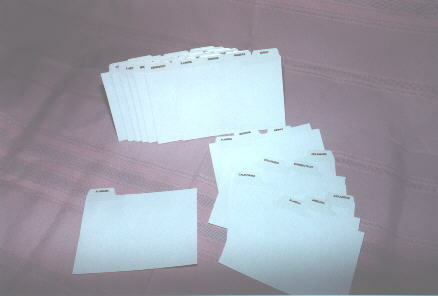 The Index Dividers are made from heavy 100# or 110# index stock with Mylar tabs. They are durable and the size makes the tabs easy to see above any size card in the Card Boxes.